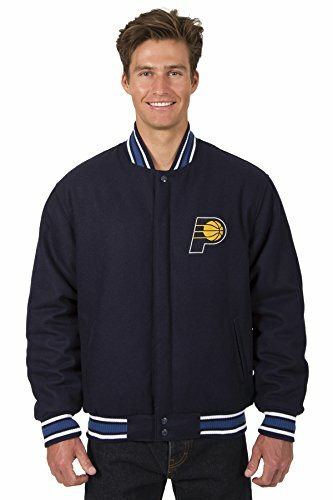 Each Jacket Ordered is Custom Cut Per Order and Manufacturer Direct Item - NBA officially licensed men's full Wool reversible jacket is made of the highest quality imported material and finished here in the USA to order with the embroidered logos on the front and on the reverse front. Featuring full wool body and sleeves reversing to a smooth body and sleeves nylon jacket. Both sides have heavy stretch knit collar, cuffs and waistband, snap-up fronts and 2 front hand pockets. PROFESSIONAL CLEANING ONLY! Body and Sleeves: 100% Wool. Reverse: 100% Nylon. Ribbing: 100% Rib Knit. Logos: 100% Embroidered. Imported/Assembled in the USA. Authorized Seller of JH Design Group. Draymond Green TEAM USA OLYMPICS Jersey Blue JSA WP Certified Autographed NBA RIO USA Jersey Very Rare!